Last weekend we were in a bit of a rush having arisen late, yet some fortification was required by the gorgeous J before tackling the long list of chores set aside for me us. 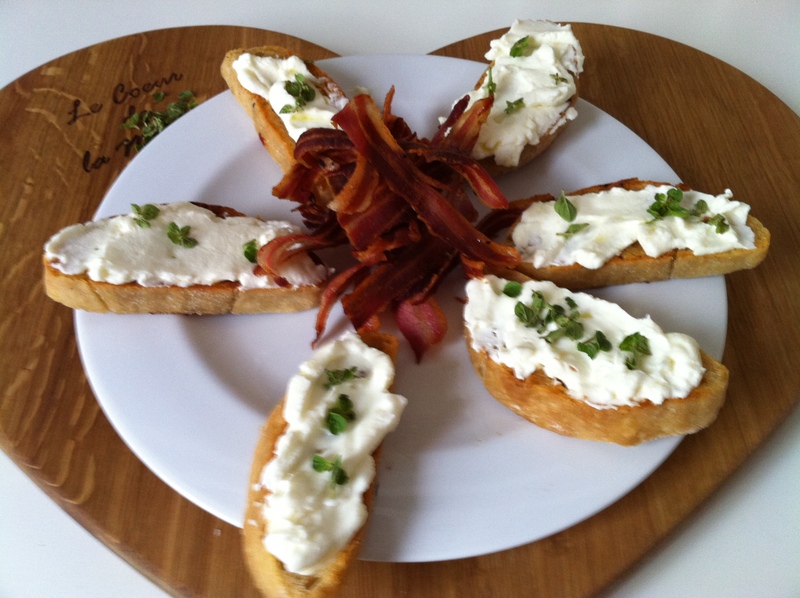 Breakfast does not always have to be all about bacon and eggs so I quickly grilled a pack of pancetta, toasted Friday nights leftover ciabatta and brought out the trusty tub of labneh that is always in our fridge for such emergencies. A sprinkle of fresh oregano from the garden and an instant snack was ready in the time it took the Moka to espress 2 coffees. As if on cue, young Zackster arrived as I finished plating the food to check if we needed any help finishing the pancetta. A couple of weeks ago I also posted a recipe that used labneh so I thought I better tell you how to make your own as it is so simple. Labneh is strained yoghurt and is eaten throughout the middle east and parts of the mediterranean. It has the consistency of cream cheese with a tangy yoghurt flavour and, of course less fat than cream cheese. You will need a piece of cheese cloth or even better if your loving mother can make a bag out of cheese cloth for you to use. Add 2 teaspoons of salt to 1 litre of low fat yoghurt. Mix well and place in the cloth bag. Hang up over night to drain and in the morning your labneh is ready. Place into a bowl and drizzle with olive oil. I have arrived! I made it onto the blog! Yipeeeeeeeeeeeee!